When David Ross retired as co-president of Burger Boat Company last year, he could have sailed off into the sunset and relaxed after a lifetime of hard work. Instead, he got a doctorate - in hot dogs - and opened the only Vienna Beef factory-certified hot dog stand in Manitowoc, Wis.
Ross, 62, jokes that he went from "Burgers to dogs," and he laughs at the irony of such a move. But he&apos;s serious about his desire to offer Chicago-style hot dogs and Maxwell Street grilled Polish sausage to folks in northwest Wisconsin&apos;s Lakeshore area. "It&apos;s something that I wanted to do all my life," he says. "To hand the person this hot dog and to make it to perfection, and the quality is just perfect and see their smile ... It just gives you a lot of pride. It&apos;s not different than an owner taking possession of his new yacht and just beaming with pride. "We&apos;re just having a heck of a time," he adds. Of course, Ross readily admits he has to sell a lot of hot dogs to equal the sale of a Burger. Around the time he left the company, Burger yachts ranged from around $20 million to $30 million. A Chicago-style dog goes for $2.50, a Maxwell Street sausage for $3.50. Ross grew up in Chicago and moved back there after serving in the Marine Corps. In the mid-1960s he started his own business towing cars, which gave him the opportunity to drive all over and find the best hot dogs the Windy City had to offer. "I always had a taste for hot dogs, my whole life, and I had the opportunity to try all of the greatest hot dog stands throughout Chicago," he says. "I had my favorites, and figured out why [they were my favorites] and took my little notes along the way in my mind. ... I always said to myself, &apos;Someday I&apos;ve got to do this,&apos; because I just love the culture of it." Ross, along with Jim Ruffolo, bought Burger in 1993, bringing back a company that had been shut down since 1990. His retirement was announced in August 2007, and he left the company in the first quarter of 2008. "I loved Burger with all my heart," he says. "I&apos;m so proud of the level that was attained. I&apos;m very happy with where the company has been and where it&apos;s going. "My goal at Burger was to build the best megayacht, and my goal right now is serving the best sandwich that I can," he says. And he takes his new profession seriously, having graduated from Vienna Beef Hot Dog University with a Ph.D., making him a professor of hot dogs. That&apos;s why his stand is called Dr. Dawg. His Web site provides a fun look at Chicago-style dogs, including the proper toppings and the order in which they should be added: yellow mustard, bright green relish, fresh chopped onions, two tomato wedges, a pickle spear or slice, two sport peppers and a dash of celery salt. "The placement of the toppings is extremely important," Ross says on the site (www.drdawg.net). "If your Chicago dog has been made properly, you will get a taste of each ingredient in every bite." The site also instructs visitors that one should never put ketchup on a hot dog. Instead, ketchup can be used to shine copper, fight skunk odor or clean auto parts. 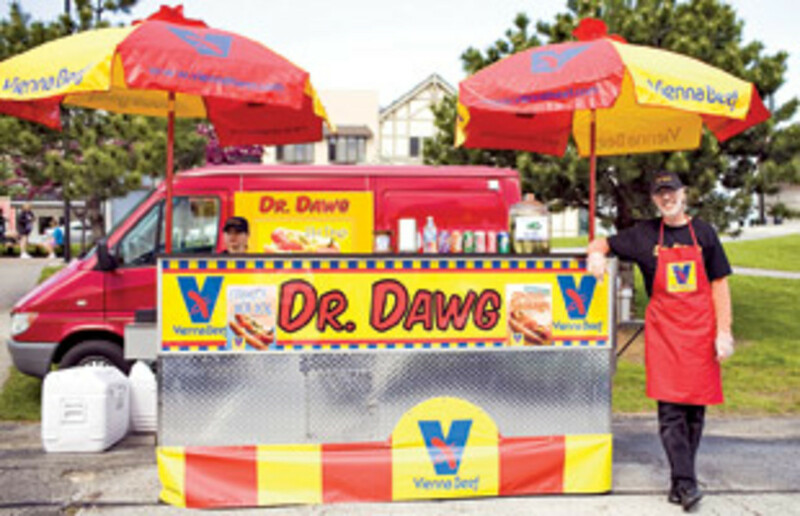 Dr. Dawg can be found Saturdays and Tuesdays at the Farmer&apos;s Market in Manitowoc, as well as various special events, such as the Manitowoc County Fair in August. The doctor also offers catering services. Based on comments left on the "Dawg Blawg," the hot dogs are a hit. "The dog hit the spot. I&apos;ll be back for more," writes Glenn. Ross says passion and hard work are a good recipe for business success, whether in boatbuilding or hot dogs. "As far as I&apos;m concerned, quality creates its own demand, and that translates from one business to another," he says. "If you&apos;re an entrepreneur, you do one, you make a success of it, and you move on to another.